It is often said that a culture can be defined by what it throws away. Let me present a variety of containers from the collection that were meant to be tossed, and yet have somehow survived to tell, or at least hint at, their stories. 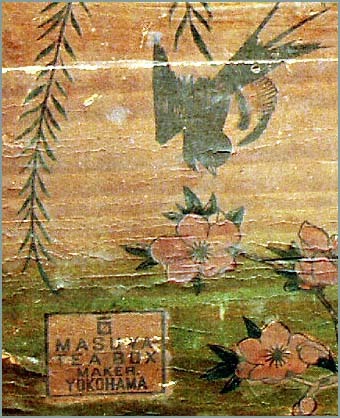 A proliferation of such relatively disposable containers came as mass production in various materials, printing, papermaking, and packaging was perfected. 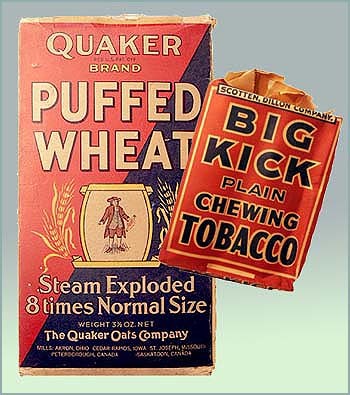 Riding on these technologies, the marketing power of graphics, brand-names, trademarks, and advertising entered brave and audacious new realms as the 19th century advanced toward the 20th. These substantial, faux-wood grained, and decidedly non-disposable drawers from an early 1800's Freeport chandlery and dry goods building reflect a centuries-old importing and distribution system. 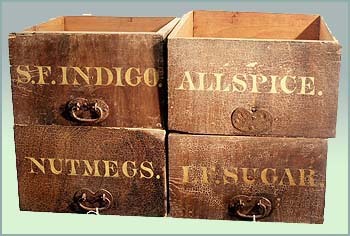 The spices in these drawers, and most every other imported article, arrived by ship right at the chandlery dock in barrels, boxes, bins, bottles or baskets that were intended for re-shipment, or at least re-use. Barrels were often broken down and sent back as loose staves and hoops, for reassembly when re-filled. But the nature of shipping containers changed. 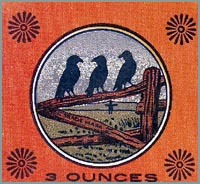 Though virtually a century old, this colorful 'Three Crow' brand packet ca. 1910 feels entirely familiar to us. 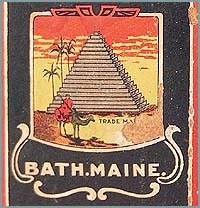 The distributor was still buying in bulk, but probably from aBoston or New York importer, who was "shipping" via steamer, or more likely, railroad to the Atlantic Spice Co., Rockland, Maine. 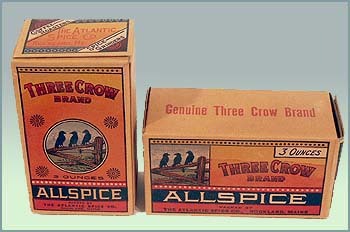 We have a dozen of these boxes, never opened and as aromatic as any allspice in the baking aisle today. 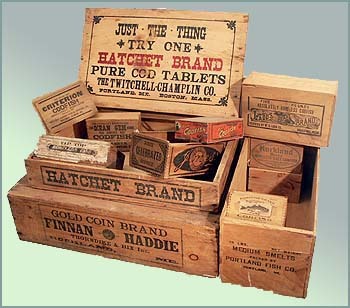 With the development of box embossing printers, graphic splendor was lavished on the prosaic pine fish-box. You weren't just buying fish, you were buying Gold Coin, Pearl, Ocean Gem, Criterion, Pure, and Absolutely Boneless. Though sometimes a smelt (lower right) is just a smelt. 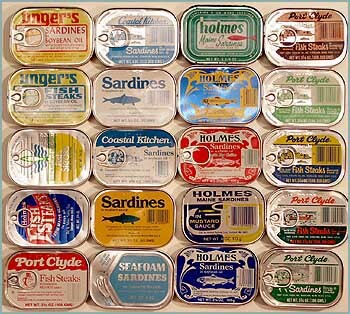 A school of sardine cans, reflecting more recent efforts to perk up the store-shelf appeal of a fish that has swum out of popular taste. Herring supply fluctuations, with associated Canadian consolidation of the industry, have also greatly reduced the number of Maine sardine processers. Very few of these cans can still be found, even though some are recent enough to have bar codes. Though you may more readily reach for a can of Pacific tuna, remember that packing those fish steaks in hot sauce kept someone employed on the fish line for at least a few more seasons. 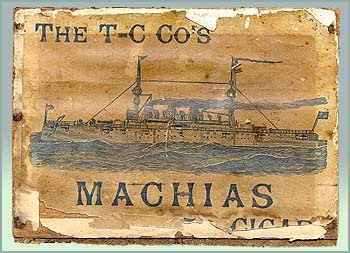 This cigar box label leads one to assume that the cigar was named after the first all-steel gunship built in Maine, which was in turn named after the Down-East coastal town of Machias. Perhaps it is a bit unfair to expect too much of cigar box labels. Closer comparison to the real vessel, as seen refitting in Bath in 1914 (above), reveals considerable differences (number of stacks, stern profile), and yet there were no other naval vessels named Machias until well into WWII. 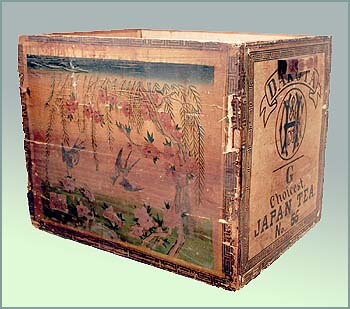 The finger-jointed corners and two foot depth of this tea-shipping box gave it the size and strength to be a practical bulk container that would survive the stresses of dockside handling and stowage in the hold. 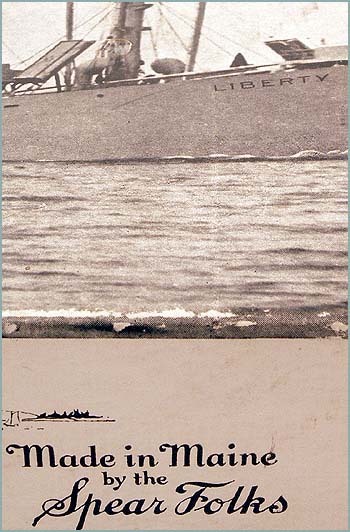 It was also wrapped by its Japanese manufacturer with a paper covering far too elegant for wholesale transport, designed instead to appeal to the retail end of the journey, where the box probably became part of the local merchant's eye-catching branding strategy. 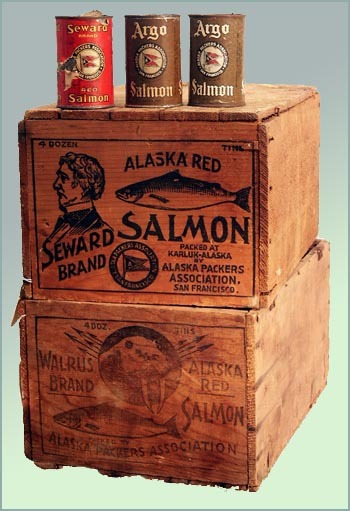 No yacht club burgee, the pennant above was more readily found on the labels wrapped around cans of Alaska salmon. These humble cans extended the career of this big blue-water vessel. 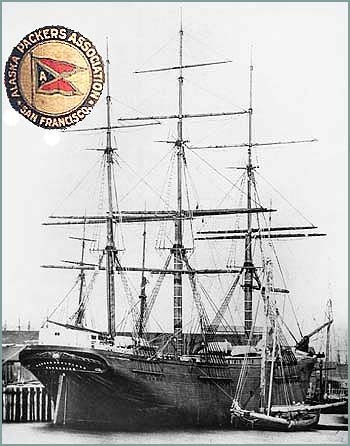 With her ballast removed, the 1870 Brunswick, Maine-built George Skolfield (above) rides high in the water at a San Francisco wharf, awaiting a change of fortune in 1893. 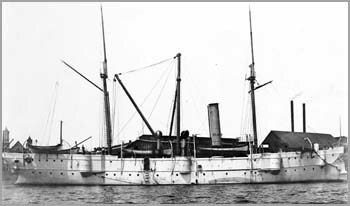 Sold with relief by the Skolfield family who had built and owned her, she was the first of numerous deep-water vessels pressed into servicing canneries by the Alaska Packers Association, financial cast-offs as overseas trade under sail dwindled. Look for their name and the pennant on the cans and crates below. It has been 150 years since empty bottles like this were commonly thrown in the trash. Whale oil production peaked in 1856, dropping rapidly thereafter as petroleum or "coal-oil" distillation surged ahead. The cost per gallon of the new stuff spewing out of the ground in Pennsylvania and Texas proved out to be four to ten times cheaper than chasing ever-scarcer ocean mammals to the ends of the earth. 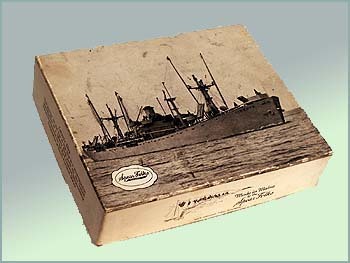 Although there are many memorials, museums, and memories devoted to the extraordinary WWII shipbuilding effort known as the Liberty ships, over 230 of which were built in South Portland, they have also been "immortalized" after a fashion on candy boxes and soda cans. We don't know what sort of candy the Spear folks packed into this box, but it played on the local Portland candy consumer market's great pride in their shipyard, probably post-War. It is interesting to note that historical accuracy has been retouched here, too. 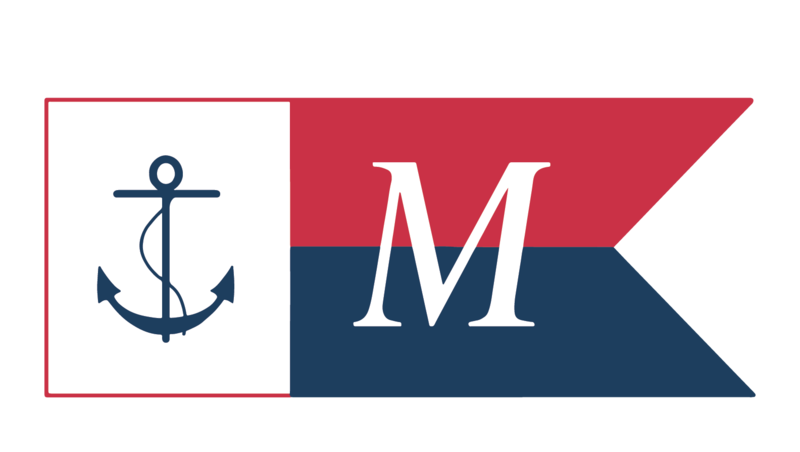 There was never a Liberty ship actually named Liberty; they were always named for specific people. Time only increases nostalgia, particularly with old ships. 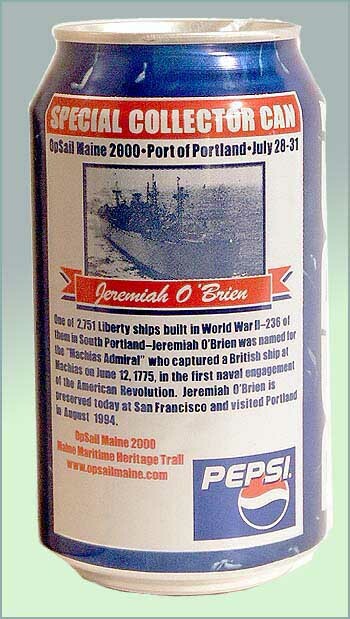 This OP-Sail Maine 2000 soda can also sports a Liberty ship, cannily cashing in on the general maritime buzz of that tall-ship event. Incidentally, along with a beer bottle from the same event, it is the only artifact we have so far that has an Internet address printed on it. This may seem trivial, but these now ubiquitous "dot-com" URL's (Uniform Resource Locators) have only been in use for barely a decade at best on commercial packaging, and so represent a fairly specific time-line horizon for future cultural historians. This paper wrapper from a Rockland, Maine hardware store, possibly from around 1940, was used to enfold a customer's selection of fishhooks or flies, a precursor to the clear plastic bubble packs that currently facilitate handling (and display marketing) of small hooked objects. 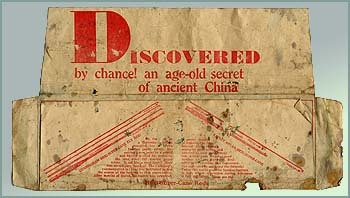 Who could resist the come-on of the large print to learn about Super-Hexi-Cane fly-rods and their wondrous bamboo treated by a secret process, "handed down through scores of generations and guarded as only the Chinese can guard such secrets," and (wouldn't you know it), "Our representative succeeded in acquiring the formula!" Intact top hats in good condition are rare enough, but consider that the pasteboard store-box that it came in is almost as masterful a construction and even more fragile. 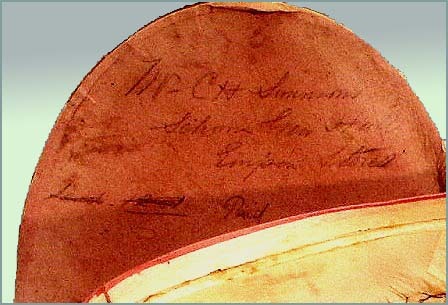 An intriguing penciled receipt note can just be made out on the lid (below): "Mr C.H. Simmons, Schooner Geo.[Gen.?] 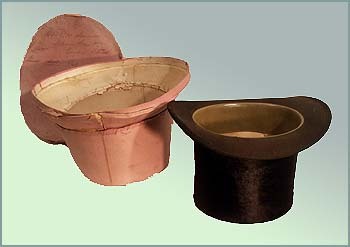 Hall, Empire Stores, Paid"
The hat was meant to survive, but the box never. Given we have both, Mr. Simmons may have decided that his head gear was cutting it a little too fine for deck-wear. We'll end on a sweet note. I have tried to feature items with a maritime angle, but there are hundreds of marvelous 1880-1920 period containers here, collected simply because they would have been found in local shipyard workers' houses in this time frame, the interpretive window we most often look through. Such are these. With the penny for scale, the little "take-out" container seems of a size too small to get very far without instantly melting, or instantly being eaten. 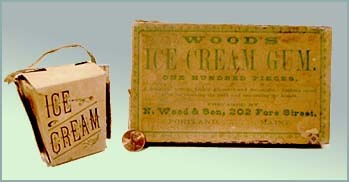 It may have been the precursor to that supremely disposable container, the ice cream cone, first patented in 1903. As for Ice Cream Gum: sounds like one of the lost wonders of the confectionary world, along with Nectar of the Gods, and Ginger Ale Pie.